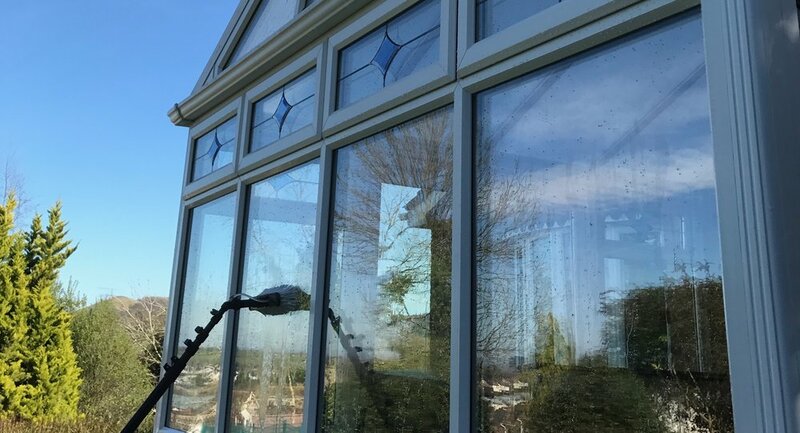 Smart Alex Window Cleaning specialise in full conservatory cleaning. Over time the British weather can make the outside of conservatories look more like the gardens they sit in! In addition, the temperature changes inside conservatories mean that there is a build-up of condensation. Eventually this encourages mould growth that is unpleasant to look at in a room made entirely of glass and PVC. Here's where Smart Alex can help. We offer a full conservatory cleaning service in the Cheltenham and surrounding Gloucestershire area. We clean each and every part of your conservatory using eco-friendly methods to clean the inside of your conservatory and our usual water fed pole method to get the outside clean. Our methods ensure that mould is kept at bay for long periods of time before the need to clean again (although we recommend you keep your conservatory at a steady temperature to reduce cleaning intervals). Conservatories are a large investment in your home and we believe that they should be looked after. Our prices start at £50 for exterior conservatory roofs. Why not take a look at some of our previous work to see the results we get. Our customer service is second to none and we make sure you are entirely happy with the service before we leave. If this is something you are looking to have done, don't hesitate to call or email us and we will get back to you as soon as we can. (usually the same day).